When searching, I seem to only be able to find people who did not know to use the 2D version of colliders or methods, so it's been difficult to find an answer for this. 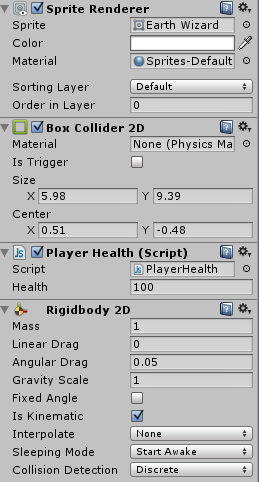 I have two objects I want to collide (this game is a top view, so gravity does not come into play here). When the fireball flies, it goes straight through the player without ever logging a collision. They are both on layer 0. Am I missing something small? Since your Fireball object has a trigger collider you should use OnTriggerEnter2D instead of OnCollisionEnter2D. 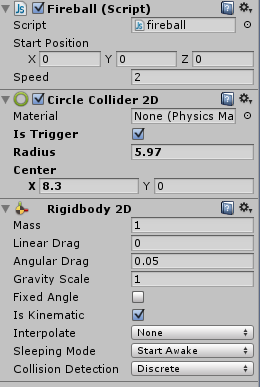 Also from your Fireball and Player game object uncheck Is Kinematic since kinematic ridigbodies don't participate in collisions (Ref: Rigidbody2D.isKinematic). 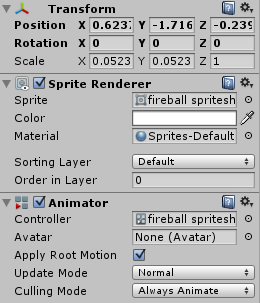 Now since your Fireball and player is not kinematic anymore you should move it using Rigidbody2D.MovePosition from your FixedUpdate() for proper physics. Perfect, I did what you said and it looks much cleaner and works as intended, except that the fireball does not move in the way it's rotated, so I suppose I will keep using my Vector3 code for now, and try to figure out how to do that properly. Since they are not kinematic but I do not want gravity to affect them, I turned the gravity scale to 0. Is this the proper way to handle that?